As cravings go, the craving for the perfect morning cup of tea in jolly old England rivals that of the most highly-caffeinated Pacific Northwest latte-addict. So, in the late 1800s, some inventive folks started thinking about what was actually required to get the working man (or woman) out of bed in the morning. An alarm clock, certainly. A lamp of some kind during the darker parts of the year (England being at roughly the same latitude as the State of Washington). And, most importantly, that morning cup of tea. 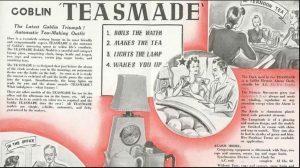 A few patent filings later, the “Teasmade” was born. According to Wikipedia, they reached their peak of popularity in the 1960s and 1970s…although they are now seeing an increase in popularity again, partly as a novelty item. You can buy one on eBay for under $50. 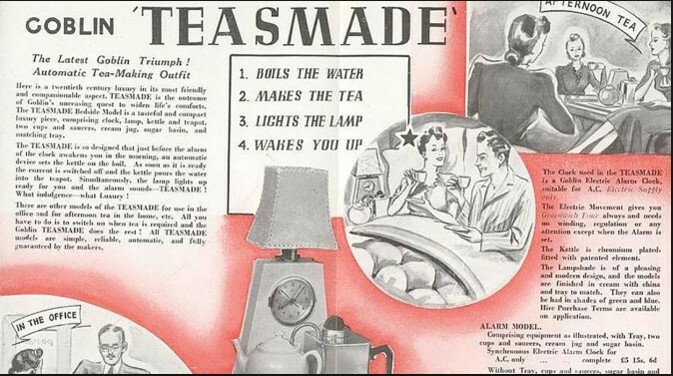 The Teasmade, ladies and gentlemen, is an example of a converged appliance. It integrates multiple components – an alarm clock, a lamp, a teapot – into a pre-engineered solution. And, for it’s time, a pretty clever one, if you don’t mind waking up with a pot of boiling water inches away from your head. The Leatherman multi-tool is another example of a converged appliance. You get pliers, wire cutters, knife blades, phillips-head and flat-head screwdrivers, a can/bottle opener, and, depending on the model, an awl, a file, a saw blade, etc., etc., all in one handy pocket-sized tool. It’s a great invention, and I keep one on my belt constantly when I’m out camping, although it would be of limited use if I had to work on my car. How does this relate to our IT world? Well, in traditional IT, we have silos of systems and operations management. Depending on the size of the organization, we often have separate admin groups for storage, servers, and networking, and each group maintains the architecture and the vendor relationships, and handles purchasing and provisioning for the stuff that group is responsible for. Unfortunately, these groups do not always play nicely together, which can lead to delays in getting new services provisioned at a time when agility is increasingly important to business success. Converged systems attempt to address this by combining two or more of these components as a pre-engineered solution…components that are chosen and engineered to work well together. One example is the “VCE” system, so called because it is a bundle of VMware, Cisco UCS hardware, and EMC storage. A “hyperconverged” system takes this concept a step further. It is a modular system from a single vendor that integrates all functions, with a management overlay that allows all the components to be managed via a “single pane of glass.” They are designed to scale by simply adding more modules. They can typically be managed by one team, or, in some cases, one person. VMware’s EVO:RAIL system, introduced in August of last year, is perhaps the first example of a truly hyperconverged system. VMware has arrangements with several hardware vendors, including Dell, HP, Fujitsu, and even SuperMicro, to build EVO:RAIL on their respective hardware. All vendors’ products include four dual-processor compute nodes with 192 Gb RAM each, one 400 Gb SSD per node (used for caching), and three 1.2 Tb hot-plug disk drives per node, all in a 2U rack-mount chassis with dual hot-plug redundant power supplies. VMware has now given hardware vendors more flexibility in configuring the appliances: They can now include dual six-, eight-, ten-, or 12-core Intel Haswell or Ivy Bridge CPUs per node, 128 Gb to 512 Gb of RAM per node, and an alternate storage configuration of one 800 Gb SSD and five 1.5 Tb HDDs per node. The hardware is bundled with VMWare’s virtualization software, as well as their virtual SAN. The concept is appealing – you plug it in, turn it on, and you’re 15 minutes away from building your first VM. EVO:RAIL can be scaled out to four appliances (today), with plans to increase the number of nodes in the future. However, as soon as you move beyond this very small scale of deployment, you enter a situation where rigid convergence makes little or no sense at all. Just as you wouldn’t offer to serve tea to twelve dinner guests by brewing it on your alarm clock, the idea of scaling cookie-cutter converged appliances begs a bit of careful reflection. If your environment is like many enterprises that I’ve worked with in the past, it has a big mix of server VMs. Some of them are incredibly demanding. Many of them are often idle. All of them consume RAM. The idea that as you scale up these VMs on a single server, that you will simultaneously exhaust memory, CPU, network, and storage capabilities at the exact same time is wishful thinking to the point of clinical delusion…what value is there in an architecture that forces you to scale out, and to replace at end of life, all of your resources in equal proportion? Moreover, hyperconverged systems are, at the moment, pretty darned expensive. An EVO:RAIL system will cost you well over six figures, and locks you into a single vendor. Unlike most stand-alone SAN products, VMware’s virtual SAN won’t provision storage to physical servers. And EVO:RAIL is, by definition, VMware only, whereas many enterprises have a mixture of hypervisors in their environment. (According to Todd Knapp, saying “We’re a __________ shop” is just another way of saying “We’re more interested in maintaining homogeneity in the network than in taking advantage of innovations in technology.”) Not to mention the internal political problems: Which of those groups we discussed earlier is going to manage the hyperconverged infrastructure? Does it fall under servers, storage, or networking? Are you going to create a new group of admins? Consolidate the groups you have? It could get ugly. So where does this leave us? Is convergence, or hyperconvergence, a good thing or not? The answer, as it often is in our industry, is “It depends.” In the author’s opinion, Andy Warfield is exactly right in that today’s hyperconverged appliances address fairly narrow use cases. On the other hand, the hardware platforms that have been developed to run these hyperconverged systems, such as the Fujitsu CX400, have broader applicability. Just think for a moment about the things you could do with a 2U rack-mount system that contained four dual-processor server modules with up to 256 Gb of RAM each, and up to 24 hot-plug disk drives (6 per server module). We’ve built a number of SMB virtualization infrastructures with two rack-mount virtualization hosts and two DataCore SAN nodes, each of which was a separate 2U server with its own power supplies. Now we can do it in ¼ the rack space with a fraction of the power consumption. Or how about two separate Stratus everRun fault-tolerant server pairs in a single 2U package? Innovation is nearly always a good thing…but it’s amazing how often the best applications turn out not to be the ones the innovators had in mind.